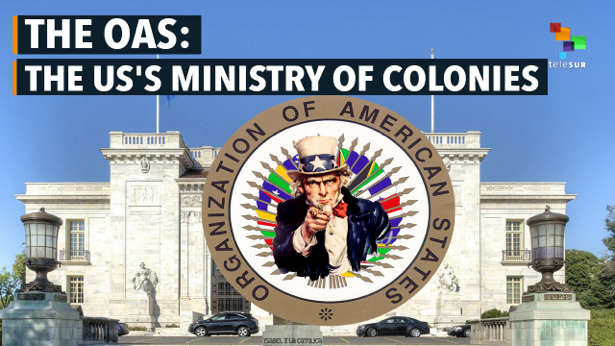 Fidel Castro once referred to the Organisation of American States (OAS) as the US’s Ministry of Colonies, and indeed its entire history is one of abject submission to US imperialism and promoter of US imperialist interests throughout Latin America. It is now being used to spearhead a propaganda assault on Venezuela which is only too likely to be used as the basis for military intervention by US imperialism and/or its regional stooges. Following the Bolivarian revolution in Venezuela led by Hugo Chávez and the failure of US imperialist attempts to overthrow it, Venezuela enjoyed something like a decade of being able to redistribute the country’s oil wealth for the benefit of the Venezuelan masses and considerably improve the lot of the country’s poor. “The facts speak for themselves: the percentage of households in poverty fell from 55% in 1995 to 26.4% in 2009. When Chávez was sworn into office unemployment was 15%, in June 2009 it was 7.8%” (Oscar Guardiola-Rivera, ‘Hugo Chávez kept his promise to the people of Venezuela’, The Guardian, 5 March 2013). However, as far as imperialism is concerned, spending good oil profits on improving people’s lives – especially the lives of people who do not live in an imperialist country – is an irresponsible waste of resources amounting to the worst of economic mismanagement, a view shared by Venezuela’s local comprador bourgeoisie. As a result, no sooner had Venezuela’s economic position been rendered difficult by the abrupt fall in world oil prices, US imperialism expected to be able to move straight back in to regain control in the name of responsible economic policy. The death of Chávez also gave imperialism hope that it would not be difficult to sideline the Bolivarian revolutionary government, now led by Nicolás Maduro. The imperialists have, however, so far been unable to fulfil their dreams, and the main reason for this is the ongoing strong popular support for the Maduro government, despite its relative economic weakness and despite the efforts of the local bourgeoisie to assist imperialism in every possible way by facilitating chaos in the distribution of goods to the people who need them. Between imperialism and its local lackeys, they have made sure that the Venezuelan people suffer as much as possible for backing the Maduro government – something that did enable MUD, a motley coalition of anti-government political hacks, to win National Assembly elections in 2015. However, when the opposition tried to put together a petition calling for a referendum to remove Maduro from office before his term ends next year, it could not get sufficient signatories even to make up the modest number needed and ended up resorting to using the names of thousands of people who had died! Nothing could better illustrate the weakness of the internal opposition to the Maduro government better than that clumsy fraud. The opposition are using their control of the National Assembly to frustrate as far as they are able the functioning of government. The aim is to cause the people of Venezuela to give up their support for the Bolivarian revolution because the price is just too high. One of its tactics has been deliberately, and quite unnecessarily, to operate unconstitutionally so that the judiciary is obliged to declare its legislation illegal and void. It has done this by insisting on swearing in as members of the Assembly three candidates whose election was declared null and void because of clear evidence that they had been purchasing votes. Because of the participation of these three non-members as members of the Assembly, all the latter’s decisions are tainted, leaving the government frustrated when important decisions that need to be made are not taken, or not lawfully taken. One of the duties of the National Assembly is to approve applications for joint ventures in the oil industry. Its approval was therefore constitutionally necessary for a proposed joint venture between the Venezuelan oil company PVDSA and Rosneft of Russia, which would have incidentally offered the government some much needed financial assistance. In its capacity as saboteur of the Venezuelan economy, however, there was no way that the National Assembly would have approved the application, with or without the three illegal ‘members’, so the Venezuelan judiciary abrogated for itself, in view of the fact that the National Assembly was temporarily incapacitated, the power to approve this particular application. It is in fact very arguable that the court had the right to do this by virtue of Article 336.7 of the constitution which gives the court the authority to "declare an unconstitutional default in the national, state or municipal legislature… and establish, if necessary, corrective measures". There does not seem in principle any reason to think that ‘corrective measures’ could not include exercising the powers itself until the situation is resolved. This was the cue for the imperialist propaganda machine to go into overdrive declaring that Maduro had suspended parliament and appointed himself dictator! Thus CNN screamed that Venezuela’s National Assembly had been dissolved by the High Court, The Guardian referred to the Supreme Court seizing power, and an article in the New York Times on 30 March was entitled ‘Venezuela muzzles legislature, moving closer to one-man rule’. And of course up pops the Organisation of American States, headed by the turncoat former Uruguayan foreign minister Luís Almagro, organising an impromptu – and procedurally highly improper – emergency meeting calling for Venezuela in effect to be suspended from the Organisation and to be subjected to sanctions for having violated its solemn undertaking to be bound by the organisation’s commitment to democratic principles. At this stage, it should be mentioned, Maduro had intervened to ask the court to revise its ruling which was duly done; so if indeed there had been any breach of democratic principles this was something that had already been very promptly corrected. In the event only 20 of the OAS’s 35 members attended the ‘meeting’, making it impossible to take a binding decision against Venezuela (even if the meeting had been legally called, which it was not), although all the US stooge governments rushed to vote for a ‘resolution’ condemning that country. But still, at the instance of US imperialism, which has been threatening countries like Dominica which have the courage to support the Venezuelan position, the attempts to manoeuvre and intimidate the OAS into ‘taking action’ continue unabated. “The former Uruguayan foreign minister is quick to brand Venezuela a dictatorship for not holding a recall referendum, yet his silence is deafening vis-à-vis the Temer regime in Brazil, which came to power via a parliamentary coup that ousted democratically elected Dilma Rousseff last May. Almost a year later, its national government continues to be unelected. “Almagro likewise excoriates Venezuela regarding its ‘more than 100’ alleged ‘political prisoners’ – many of whom like Leopoldo Lopez have been convicted of inciting the violent overthrow of the government – but in no moment does he threaten to revoke Colombia’s democratic credentials over its several hundred actual political prisoners, many of whom have been on intermittent hunger strike. “While the general secretary denounces arbitrary detention and torture on the part of Venezuelan security forces, he seems entirely unconcerned about the escalating wave of paramilitary violence in Colombia that has claimed the lives of 23 community leaders during just three months of peace with the FARC. Nor does he speak out about the ongoing dirty war against social movements in Honduras, which has recently been labelled the ‘deadliest country in the world for environmental activism’. “Almagro goes on to decry corruption and drug trafficking in Venezuela, but at no time does he call for fresh elections in Mexico where President Enrique Peña Nieto … presides over a brutally repressive US-backed narco-state engaged in a decade-long war on drugs that has left over 100,000 dead and 30,000 missing. “Is this silence merely an unfortunate coincidence or is there a pattern in this selective democratic sensibility? “It should surprise no one that Brazil, Colombia, Honduras, and Mexico – together with the majority of the other signatories of a recent US-led statement demanding early elections in Venezuela – are all close allies of Washington governed by right-wing neoliberal administrations” (Lucas Koerner, ‘Luis Almagro: regime change apostle?’, 28 March 2017). “According to Venezuela’s Public Prosecution, 312 people were detained during the opposition protests, which once again saw masked demonstrators erect roadblocks, damage public institutions, and launch deadly attacks on state security personnel and bystanders. “National Ombudsman Tarek William Saab has confirmed that a National Guard sergeant, Neumar Jose Sanclemente (28), was shot and killed by a ‘sniper’ Wednesday evening ‘in the middle of violent protests in Las Salias municipality’ in Miranda state. Coronel Juan Carlos Arias was also wounded in the violent demonstrations that ‘took place since the early hours of the morning amid condemnation by local residents’. “The killing of Sergeant Sanclemente brings the total number of dead in the recent weeks’ anti-government protests to seven, including two demonstrators killed by police and two bystanders shot dead by armed protesters. “In another incident, Venezuelan news website La Iguana reports that a National Bolivarian Police officer who fell off his motorcycle was attacked by demonstrators who allegedly pulled out four of his teeth. “In downtown Caracas, Almelina Carrillo, 47, is in critical condition after being reportedly struck in the head by a frozen bottle of water thrown from a nearby apartment building in downtown Caracas. As revealed by video footage, the woman was on her way to work when she was struck by the blunt object presumably launched at the nearby pro-government march below. “Chavista spokespeople blame the opposition for the incident, pointing to a tweet by the right-wing El Nacional newspaper columnist and Central University of Venezuela professor, Tulio Hernandez, who encouraged his followers to ‘neutralise’ government supporters, alluding to the use of blunt objects like “flower pots” as weapons. “The Venezuelan Public Prosecutor’s office has indicated that a total of 62 people were wounded across the country in the course of the day’s mobilisations” (Lucas Koerner, ‘Venezuelans Flood Caracas in Pro and Anti-Maduro Marches amid Deadly Opposition Violence’. 19 April 2017). The damage inflicted on public and private property by opposition terrorists during their demonstrations throughout this month has amounted to some $US 5bn. Needless to say, calls by the Venezuelan government to the Organisation of American States to condemn opposition violence have fallen on the deafest of deaf ears! In the meantime, notwithstanding the violent threats and danger posed by the terrorist opposition, millions of Venezuelans regularly turn out in demonstrations in support of the Venezuelan government, far outnumbering the supporters of the opposition. It would seem that if the people of Venezuela are not always happy with the privations that are caused to them by the workings of the capitalist system, they have certainly not yet lost sight of the fact that their position would rapidly become considerably worsened were they to lose their government so devoted to their interests and replace it with one pleasing to US imperialism.